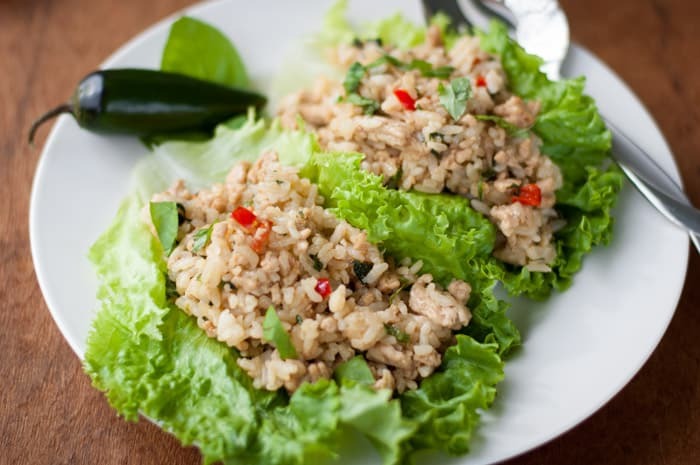 When I first heard of chicken lettuce wraps, I have to admit, I was a teeny bit skeptical. Lettuce wraps were for those “healthy” people. You know the ones. I’m more of a “let’s wrap that in cake” kind of gal. But after a few trips to PF Chang’s, I was hooked. I’ll probably experiment with more variations, but I wanted to share this particular recipe with you because it’s spicy – and we love spicy, right? It’s also more filling than PF Chang’s wraps. Filling = good. 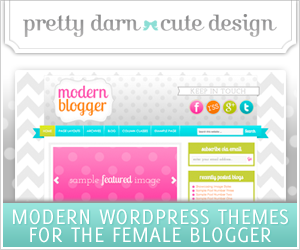 I’ve slightly adapted this recipe from Lindsay at Pinch of Yum. Hers are delicious. But this time I made them with a bit more sauce. 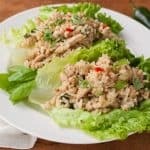 I also added more zing to turn them into spicy chicken lettuce wraps. I can never get enough spicy. Zing = spicy + sauce = disappearing lettuce wraps. That’s foodgebra. It’s the new math. 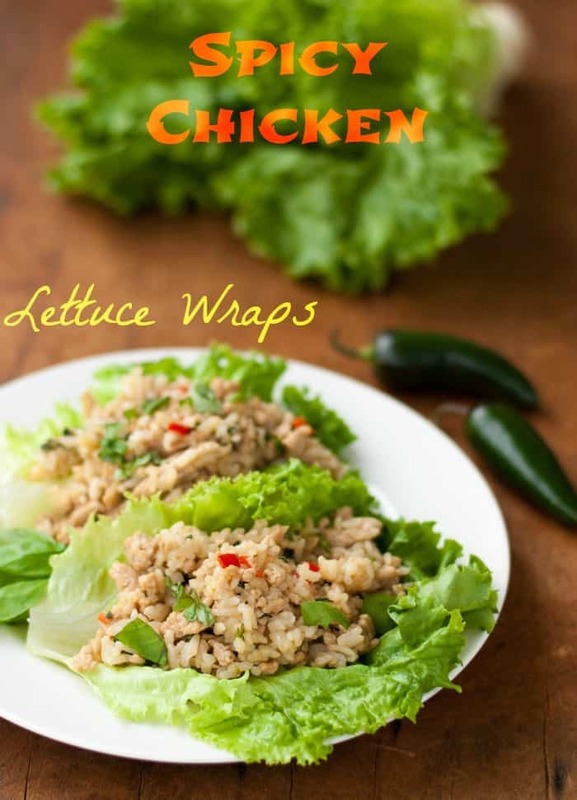 The lettuce used for these Spicy Chicken Lettuce Wraps is Green Leaf Lettuce. In small bowl, combine soy sauce, olive oil, sugar, and water. Stir and set aside. In large nonstick skillet, brown together the chicken, jalapeno, red pepper, garlic, and ginger over medium heat. After 1 or 2 minutes, add your soy sauce mixture to the meat mixture and stir. When chicken is cooked through, take pan off heat. Add rice to chicken and stir until combined. 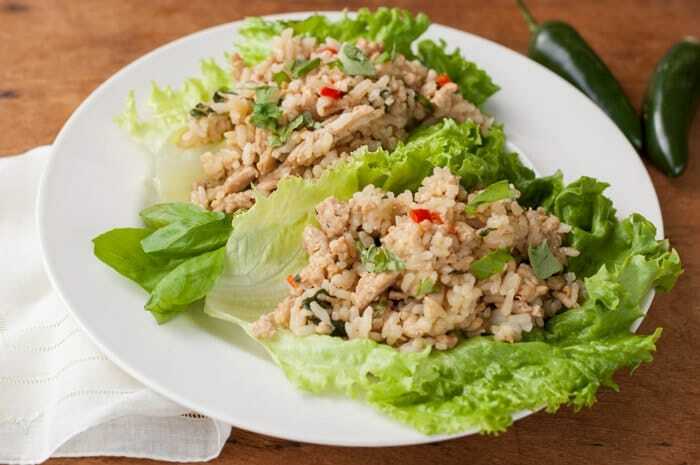 (The original recipe calls for 2 cups cooked rice, but you can add more if you have more than that in your pot). Stir in basil. Roll up into lettuce leaves and top with additional basil, if desired. You need to copyright foodgebra. It’s my favorite new word!!! 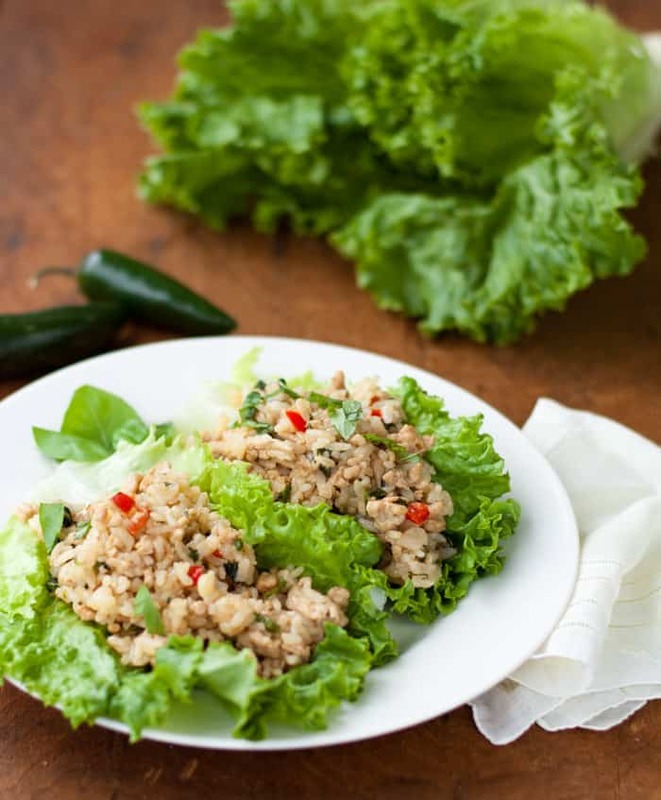 Adding a little kick to lettuce wraps – even more brilliance. Can’t wait to try them. Please let me know if you make them! 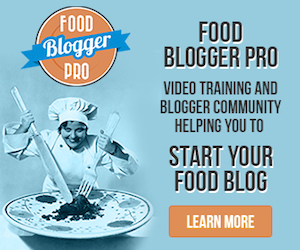 Love to hear from my readers if recipes work for them or not.